We can't do this without the amazing support we get from all of you. We know that not everyone has the time to volunteer, or can't foster or adopt. We understand, and don't ever want anyone to feel like you don't do enough. YOU ALL DO SO MUCH. We do have some updates for volunteer age limits at our adoption events. Though we truly appreciate the energy and support from our younger generation, we feel for the safety of the dogs, it is time to increase our age limits. For our dog adoption events volunteers must be over 16 years of age and only 18 and older will be assigned to the dog team. There are many volunteer opportunities available and we hope this will not stop you from helping rescue animals. Chester Dog Fair is a great opportunity for volunteers of all ages to join in the fun. We also have many fundraising opportunities available that we can always use a hand. That being said, here are a few great ways you can help! If you're an Amazon addict like most of us, simply shop through Amazon Smile to have a portion of your sale donated to Homeward Bound. It is so easy, and doesn't cost you a penny! Just click on this link below and save it as a bookmark. Then, make sure to complete all of your future Amazon purchases through that link. We need volunteers for all of our events! Before, during, and after. We also need help putting up fliers, getting donations for our fundraising events, transporting dogs to and from spay/neuter operations, and more. Please click on the button below to fill out our general volunteer registration form. Please take the time to also fill out forms for specific events. This is one way for you to share what specific events you are available for. Our next adoption event is May 18th & 19th at the Durham Fairgrounds. If there is one thing there is never enough of, it's foster homes. It is common to have an unadopted dog or two at the end of an event. When that happens, we are in desperate need of foster homes to take these dogs in until a forever home can be found. The rescue will cover all costs associated with the dog, and can even provide food if necessary. If you can open your home to a dog in need, please click on the button below to fill out our foster application. Fostering saves lives! After each adoption is final, a home visit must be completed to make sure the dog is thriving in his or her new home. This generally happens about 4-8 weeks post adoption and can be located anywhere throughout the state of Connecticut. If you have some rescue experience, and are willing to donate your time, we would greatly appreciate it. If you have successfully completed a home visit for us, please click on the link below and fill out the report. There is no donation too small! All funds raised go directly towards funding our adoption events and also go towards helping us continue to help rescues. We have donated thousands of dollars to the rescues we work with. 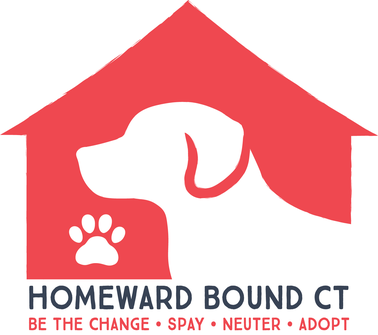 Homeward Bound CT is a registered 501c3 non-profit organization, that means all donations are tax deductible. Due to the variations of locations for our adoption events we ask that you contact us to see if we will be able to accommodate you. Contact us here.